In a few days, we are about to welcome the new year. But before we welcome 2016 with a heart full of hope, let's look back to the biggest news in 2015 and realize what have we learned from them. Who made the biggest lessons of 2015? Who influenced, entertained and intrigued you the most? 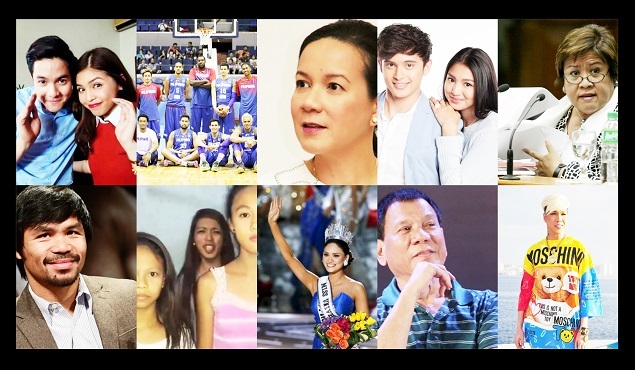 Who among these 10 biggest Filipino personalities of 2015 should be named Filipino/s of the Year? Cast your vote at the poll box after the photos below! Aldub - bringing back the traditional way of courtship and many Filipino values which the generation today does not know. Got hooked with AlDub, pero Basketball talaga nasa Puso ko Hehe! aldub for being a role model to all eapecially to the modern youth. ALDUB - their love team is phenomenal! Naka ka relate ang mga manunuod sa story nila regardless of age or gender.